Once children reach the age range (6-12), adult teeth begin to replace lost baby teeth. These new teeth are vulnerable and tooth decay can lead to fillings. Decay happens as acid attacks teeth and destroys enamel. Teeth can be under acid attack for up to an hour. As these new teeth are so important for kids, we can provide you with a few ways to prevent the decay of these new adult teeth. 1. Make sure your child brushes for 2 minutes, twice a day. They should brush all areas of their mouths, giving each area equal time. You should do this with gentle, short strokes and not forgetting to brush the tongue to remove germs and freshen breath. 2. Encourage healthy eating with a diet of vegetables, fruits and whole grains. Serve nutritious snacks to children, limiting sweets to mealtimes. Maybe include cheese with snacks, as this triggers the flow of more saliva, washing the food particles away from vulnerable teeth. Lastly concentrate on milk and water not sugary fruit or fizzy drinks. 3. Good family dental health prevents germs that cause decay being transmitted between people. This means it is important for toothbrushes to not touch as it reduces the risk of decay-causing germs traveling between brushes and into mouths. And lastly, Individual tooth brushes for each family member! Over a third of children in the UK are suffering from tooth decay with an average of 3 teeth affected. 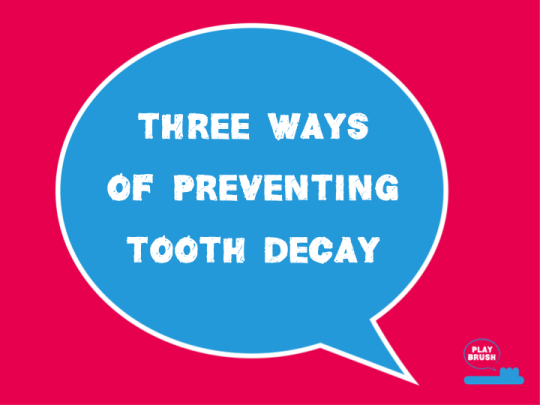 Practicing these 3 points will go a long way in your child maintaining healthy levels of oral hygiene and preventing tooth decay.